Conveniently located Off Mombasa Road, Melili road, Melili hotel offers a calm and peaceful oasis for business and leisure travelers. Its strategic location offers a magnificent view of the Nairobi City from the rooftop floor of the Hotel. The hotel is highly accessible to guests, being close to the city’s airport and railway station. The elegant 30 well-appointed rooms offer luxurious amenities and personalized service. Our dining and nightlife venues enhance the stay experience with exclusive culinary fare. An upcoming fully-equipped health club and Spa specializing in relaxation and rejuvenation treatments will pamper personal fulfillment. An upcoming well designed roof top Bar and restaurant promises a quiet, peaceful laid-back scene, complete with the comfortable loungers and parasols. The outstanding meeting, banqueting and conferencing facilities offer a perfect venue to host trainings, workshops, product launches, exhibitions, weddings and other social events. Above all, the efficient team of the hotel ensures that your every expectation is adequately met. Close proximity to all main tourist attractions. 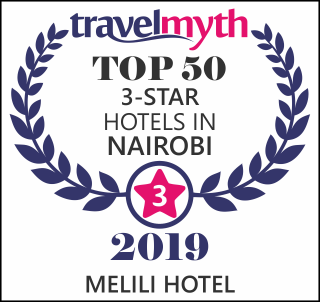 © 2019 Melili Hotel, Nairobi. All Rights Reserved.